12-year old Terry Wang 2k and 16-year old Kiren Polara 2k topped a record-breaking field of 84 players from the US, Canada, and Mexico to respectively become the Junior and Senior champions of the 6th North American Kyu Championships, held on February 2nd on KGS. Both champions have also earned the right to play in the 26th Redmond Cup, for which registration will be opening soon. Final tournaments results and the crosstab can be found here. The division winners in each of the 6 brackets received personalized crystal trophies, and all participants are eligible for a $200 scholarship to the 2019 US Go Congress in Madison, Wisconsin. 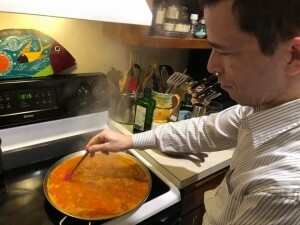 The February 22 edition of the National Go Center’s regular Friday Night Go evening will feature the Center’s first-ever Pair Go/Paella Night, beginning at 7 PM. For those not familiar with Pair Go, it is played with partners who make alternating moves but are not allowed to converse and communicate strategy. “We’ll explain all the rules when you come,” says Haskell Small. “Come with a partner, or we can pair you with someone else when you arrive.” Mixed pairs are fine in addition to the traditional M-F pairings. To make this a festive social occasion, Chris Garlock, Managing Editor of the AGA e-Journal and a former professional chef, has volunteered to make paella for the evening (vegetarian option included). Pictured is Michael Redmond 9P making paella under Chris’s tutelage last year. Please RSVP by 2/20 to Haskell Small (haskell@haskellsmall.com, 202-244-4764). There will be a $5 donation at the door to cover the cost of the paella. In an exciting 1.5 point game, Brandon Zhou (playing black) defeated Willis Huang on KGS Monday night to become the North American representative to the 2019 Globis Cup in Tokyo, Japan, April 18-22. Willis Huang 6D will play Brandon Zhou 6D Monday at 7p EDT on KGS (AGA Tournament Room) to determine the North American representative to the 2019 Globis Cup in Japan. Huang defeated Sophia Wang in Round 3 on Sunday, and then Zhou defeated Huang in Round 4, giving them each a single loss in the double-elimination qualifier and setting up a final head-to-head on Monday. Feb 3 ( Feb 4 in China) is one day away from the Lunar New Year’s eve. On that date, about 40 people, including three players from Ohio, Indiana, and Wisconsin, participated in the “Welcome Spring” Cup, a brand new tournament in Chicago. 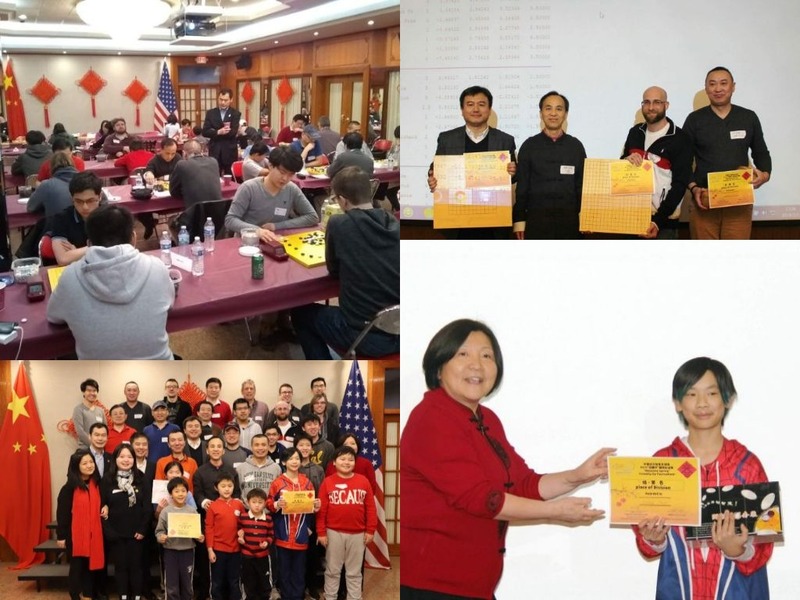 The event was hosted by Consulate General of China in Chicago, and organized by the Go and Math Academy, Evanston Go Club, Confucius Institute in Chicago, and the US-China Cultural Association. Acting Consul General Liu Jun welcomed all players with a Lunar New Year greeting. The first “Welcome Spring” Cup brings together go lovers from diverse communities and backgrounds. But beyond competition, it is also a great opportunity for players to make friends and promote understanding through the game. “This year marks as the 40th anniversary of China-U.S. diplomatic relations. I hope this event will not only help build stronger friendship among people, but also strengthen bilateral relations between the two countries,” said Mr. Liu who also participated in the tournament as a 1D player. This event is a handicap tournament with four divisions, including a youth division. About two-thirds of the participants were casual local players who had never played in tournament in the Chicago area. “It’s really encouraging to see so many new go players from the Great Chicago area come out of hiding to attend this event.” said Tournament Director Xinming Simon Guo, the founder of Go and Math Academy. The first two rounds in the Globis Cup Qualifier were held online on Saturday, February 9 (see below for results). The schedule for the Globis Cup Qualifier is now set for this weekend, February 9-10, with an additional game on Monday evening, if necessary. The format will be a double-elimination between the four top entrants: Willis Huang, 6D (16); Brandon Zhou, 6D (15); Nate Morse, 4D (19); Sophia Wang, 3D (14). All games will be played on KGS in the AGA Tournaments Room. AGA rules will be used, 7.5 komi, 1 hour basic time with 5 periods of 30 seconds byo-yomi. The games will begin at 11 AM and 3PM EDT. In the event that after Game 6 both players have a 1-1 record, a final game will be played Monday, 6P EDT to determine the championship and the North American representative to the 2019 Globis Cup in Japan. Each team will consist of five EGF- and AGA-certified professional players. The Championship will use a win-and-continue format: each player continues to play until defeated. The first round is scheduled for April 7 at 20:00 Central European Time (14:00 US EST). Later rounds will follow weekly at the same time (with some rescheduling possible for tournament conflicts. There will be no game on Apr. 28) All games will be broadcast live by the AGA broadcasting team on both YouTube and Twitch. The AGA is seeking a representative from North America to participate in the 6th GLOBIS Cup U-20 World Go Championship to be held in Tokyo, Japan between April 18-22. To be eligible, the player must be under 20 years old as of Jan. 1, 2019. Food and lodging will be paid for (including for a chaperone if the player is under 18), but NOT the cost of getting to and from Japan. If you are interested in participating or have any questions, please write to tournaments@usgo.org no later than Sunday, Feb. 3. Depending on the number of entries received there may be a preliminary tournament sometime between Feb. 4 and Feb. 15 to make the final selection.